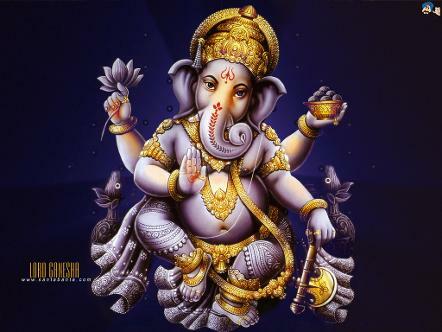 The first prayer of a Hindu is always to Lord Ganesha. Lord Ganesha is the first son of Lord Siva and Parvathy. Tamils call Him by the affectionate term “Pillayar” meaning noble child. We worship Him primarily to remove all obstacles on our path of progress and to seek His grace to grant us wisdom. When one starts a new venture, one prays to Lord Ganesha first to make sure that there are no obstacles on his / her path of progress. Lord Ganesha has the figure of an elephant head and a potbelly. He is seated on a mouse. The potbelly can contain anything and everything. The elephant represents wisdom and strength. Its trunk can remove obstacles. The large head represents an expanded consciousness. The mouse (shrew) is always associated with the earth. Almost all parts of its body are in contact with the earth. It represents the lowest type of consciousness. Man can be like the mouse, which has limited consciousness, or he can work his way up to achieve an expanded consciousness as represented by the elephant head. The mouse is also said to represent worldly desires, which are to be overcome. Ganesha Chathurthi, also known as Vinayaga Chathurthi is the foremost annual festival to Lord Ganesha celebrated on the fourth day after the new moon in the Tamil month of Aavani (August – September).